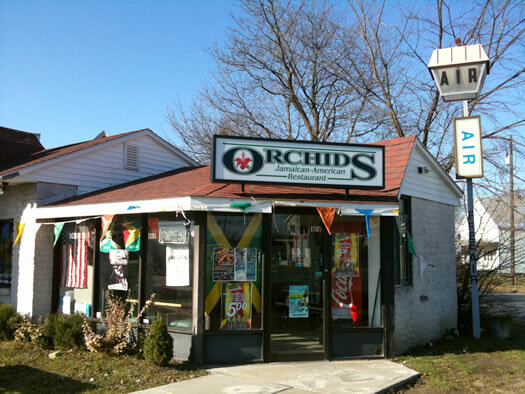 So, Orchids is not technically in the gas station. There is an entirely separate entrance. But the old air pump sign flanks the restaurant's entryway. And no, there aren't any petroleum fumes. Trust me, I'm very sensitive to these things. Inside there are only two rickety tables and five chairs. Despite the restaurant's small size, I've never had a problem getting a seat. Pretty much everyone takes their food to go. So, you are welcome to stay and eat your food out of its unglamorous styrofoam container with a plastic fork and a paper napkin. You are here for the food, not the ambience. And specifically, if you can make it between the hours of 11 am and 2 pm Monday through Friday, you are here for the brown stew lunch special. 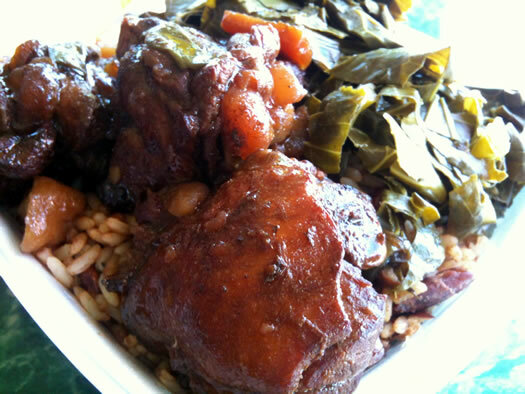 It's a densely packed container layered with rice and peas (in this case, kidney beans), three chunks of the most tender chicken on the bone you can imagine (with gravy), and a heap of collard greens (in theory there are other options, but diverge from the collards at your peril). All of this food is a paltry five dollars. And if for some reason it's not sufficient, you can supplement it with a Jamaican jerk chicken patty for less than an extra two bucks. If you cannot make it out to Rotterdam for lunch, you've got until 9 pm most nights to get a dinner of the stuff, which will set you back eight dollars for a regular or ten dollars for a large. Besides coming with more meat, the dinners also come with fried plantains. 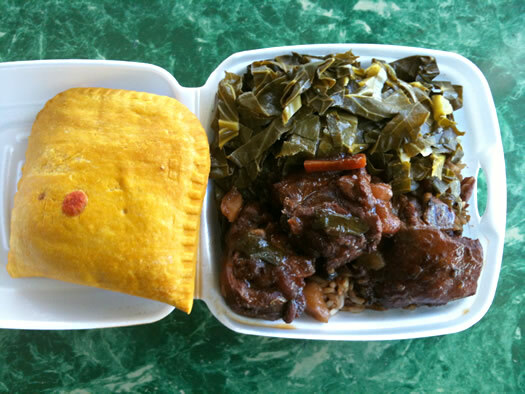 Some people may avoid Jamaican food because it has a fiery reputation. On the flip side, I know there are other folks out there who gauge an ethnic restaurant's authenticity based on how much heat it can pack into the food. These factors leave brown stew chicken as an outsider of the Jamaican food world, because this isn't a fiery dish. It's sweet and savory, and astonishingly tender. The meat holds onto the bone, yet flakes off cleanly even with just a flimsy plastic fork. Its rich, clinging gravy is lustrous and not greasy at all. In some ways it's redolent of chicken teriyaki, with the sweet and salty flavor profile. Except the brown stew has a greater depth of flavor and aromatic complexity in addition to its meltingly tender texture. Still, it's not entirely for the faint of heart. This is dark meat chicken chopped on the bone. Some pieces aren't immediately identifiable as thigh or leg, and that may give some diners pause. And given that bone has been hacked through, there is an occasional fragment to work around. But these two things work together to bring flavor to the dish. And that's what brown stew chicken is all about, because while it may not be fiery, it is far from bland. Its rich and comforting presence in the Capital Region brings some of the warmth from the islands to our frigid part of the world. Don't wait. Get down there now. Then when the new place opens, you can tell everyone how you still love it, but miss the mysterious charm of the hole in the wall at the gas station. Just call first before you make the trek. And bring cash. Authentic Jamaican Jerk Chicken is my favorite and have yet to find a good sauce/rub around here that can match what I get in Montego Bay. Will definitely check it out.